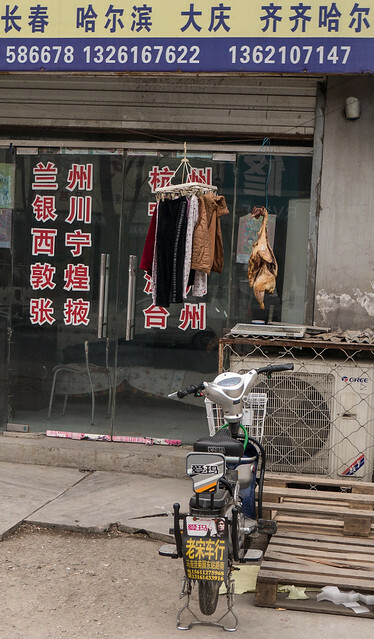 i love all the layers of chinese characters…including on the moped. you use them almost like color to lead the eye through the photograph. and, then the dead chicken amidst it all. i did look at the bigger photo…something i am doing regularly now since you have so much information in each shot. 🙂 It wasn’t until I looked at the bigger photo that I saw the man resting on the couch. We’re not sure what it is. One of many small stores in a line. I bet those would’ve been interesting stories. Is that a dead duck hanging by the clothes!? I think it is being dried. Something like that. Click-on the image to see a bigger version on flickr. My Italian grandfather often had dead chickens hanging from his clothesline! My mother- his daughter- was squeamish though, and wouldn’t let us ask him why. It was a long time ago so I don’t remember the details, like whether they were still feathered, or plucked; and whether they were hanging by the neck or the feet. Interesting. I think this one was smoked, and then hanging it on the line to dry. He also often had eels in the kitchen sink, another forbidden subject. Damn, I wish I had asked him anyway, even though I would have been punished. the juxtaposition is amazing and wonderful.